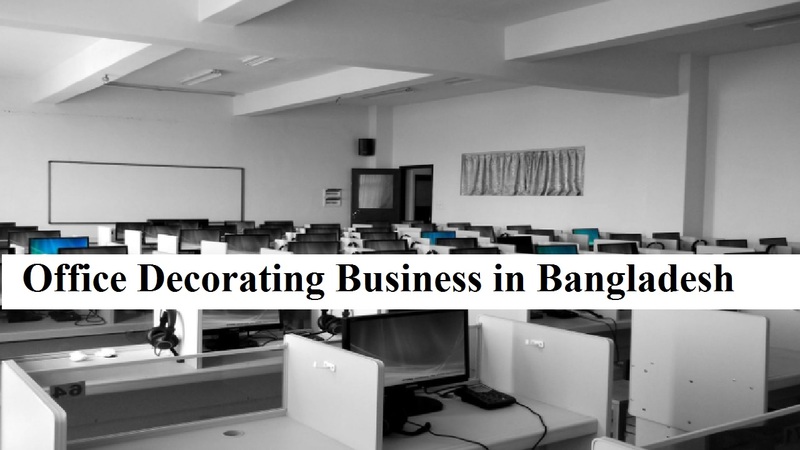 In order to create a personalized space for their office, you can start an office decorating business in Bangladesh. You’ll work with a variety of people with different tastes and decorating goals when you’re a professional decorator. Also, it doesn’t require any specific educational degree if you want to start this business. However, essentially you should work with people and learning about the latest trends in decorating along with some business management knowledge. And it’s one way to maintain steady profits to build a client base through referrals and additional projects from existing clients. Moreover, the office interior design is equally impressive and it’s a legendary startup. They’re opting for spaces as companies break down the traditional ways of doing business. That’s why office decoration is important as they focus on ways to make their business a success. An office is a home away from home and it’s the place where people fight for market share, pursue new business opportunities, and realize their dreams. This is not only applicable to foreign countries but the same thing happen for Bangladesh as well. And, there are office decorating works that are in need of expert interior designers in Bangladesh. But, it’s the most demanding to the house builders to develop the look of their houses. Since they build offices for the purpose of business, it should be attractive to the buyers and other clients. As a result, they search for the expert office interior decorator. Besides, some people like to make their office a new look using interior decoration. That’s why you can start an office decorating business in Bangladesh. As many people are doing, it could be yours as well. With a professional business image, the most productive offices typically balance the comforts of home. It’s to achieve your objectives without busting your budget; it could use some fine-tuning or perhaps even a completely new approach. We’ve come up with eight important things to consider whether you’re just getting started with a new office space or hunting for a guide to breathe new life into an existing space. If you follow these guiding steps, you’ll be sure to put your best foot forward on the path to business success. Well, let’s know what the steps to start an office decorating business are. For each stage of business development, you need a business plan and that should follow always. A business plan not only comes with a description of the types of decorating services to provide clients but it also comes with various business strategies. You have a flexible option either you can rent a commercial space or create a home office. When you’ll have an office space, you should use it to display photographs of previous decorating jobs, display sample materials and to meet with prospective clients. And if you want to find an appropriate space then you should contact a commercial real estate agent. But, contact the local small business development or small business administration office to ask if a home permit is needed to run your business out of your home while creating a home office. Besides, if you want to meet with clients in your home, you may need additional permits. So, necessarily you should make an office whether it’s a rental space or your home space. If you like to start an office decorating business, you must know the basics of design. So, it’s fundamental to office decorating to understand the way your space works. The design is not only visual but physical as well. Balance, emphasis, movement, and patterns are the elements of design and the single most important element of the interior design is lighting. Moreover, there are three different forms of these lighting, such as ambient lighting, overall illumination, and accent lighting. They are used to make the interior design more enticed. Besides, you can give your decoration business a unique and personalized touch while focusing on the basics of interior design. This is because people will seek you out for your particular specialty. Now, it’s time to market your office decorating business and advertising can follow many different paths. You should speak with as many members of your community as possible when you want to start spreading word of your business by word of mouth. This way you should encourage them to contact you with any potential inquiries after letting them know about your business. And as an interior decorator, you should ensure you attend any markets or trade shows where people might be going to look for goods for their homes, and discuss your availability. Also, you can start advertising in newspapers, on the radio, or on television when your business is official. And these are the ways that you’ll reach your business to the larger audience. If you don’t know where to go for the adequate training then turning your passion into a career can seem like a daunting task. Also, they may not have been trained on how to turn a classroom lecture into real-world business those who have received a formal education. But, for those who are interested in joining the industry, they can get multiple types of training that are available. For example, you can get trained from design schools and formal degrees along with online courses if you’re really want to learn. So, there is no alternative to get the training to learn what you don’t know about an office interior business.